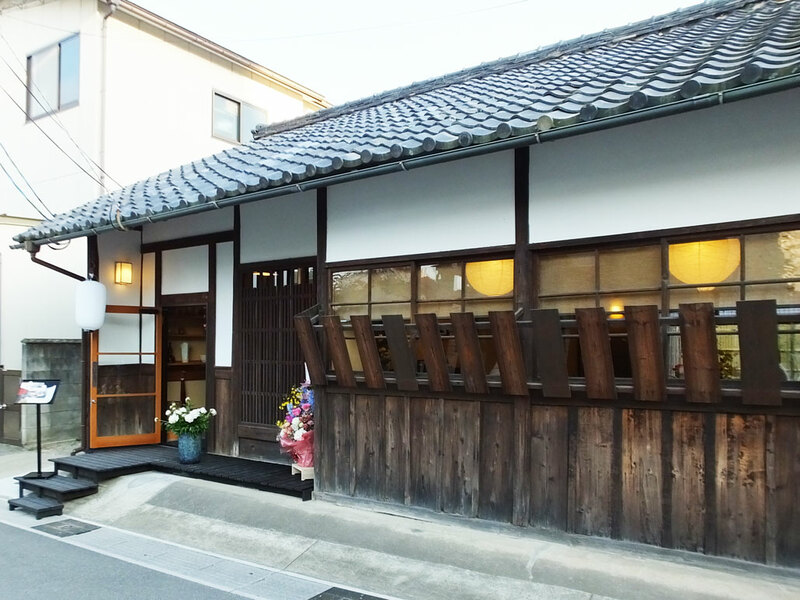 In April 27, 2018, Cafe Waraku opened near Byodoin Temple in Uji, Kyoto. 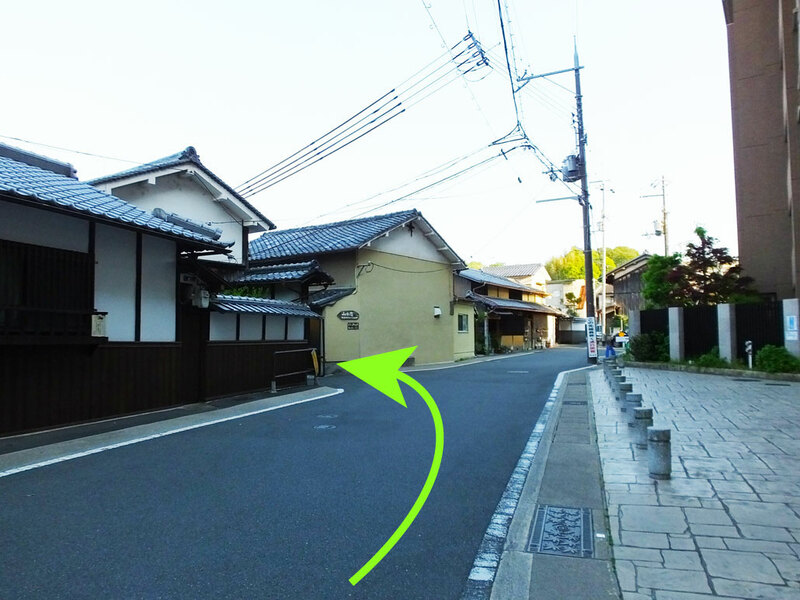 In this area, you can enjoy your trip at your own pace as it is less crowded than the central area of Kyoto City. 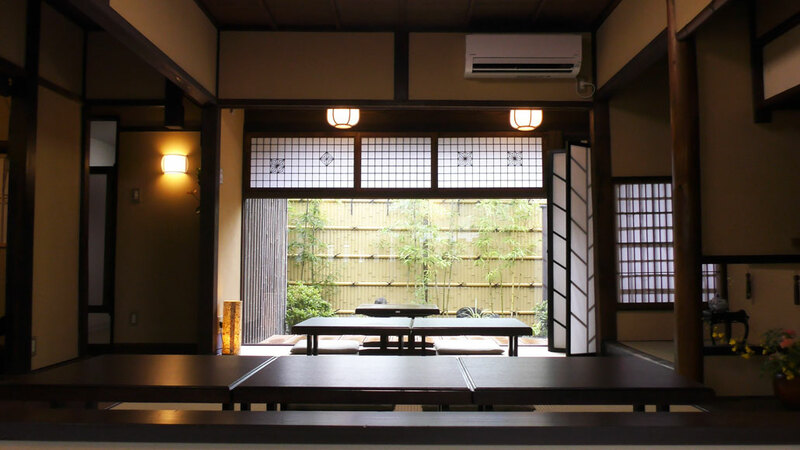 In such a nice place, an old Japanese-style house (Japanese: kominka) was renovated to be Cafe Waraku. 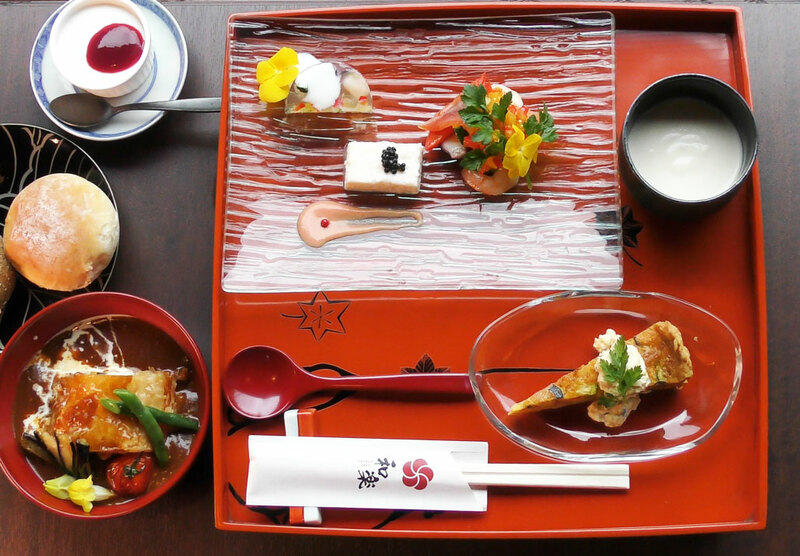 There you can enjoy delicious food and drink with shikki lacquerware. The shikki lacquerware is known as “japan” in the world because it represents traditional Japanese craft with its long history. Cafe Waraku is loved by the locals as a pleasant place like a hideaway. It is on a side alley and it is not crowded there. Now I’ll introduce you to how to get there. 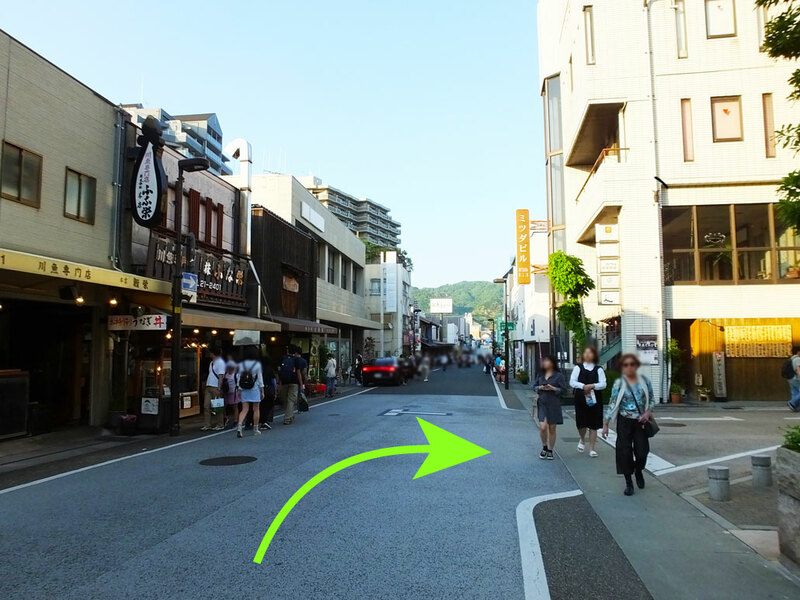 Walk down Ujibashi-dori Shopping Street toward Uji River. Turn right at the eel shop, Funaei. Turn left at Shokudo Yamagoya. 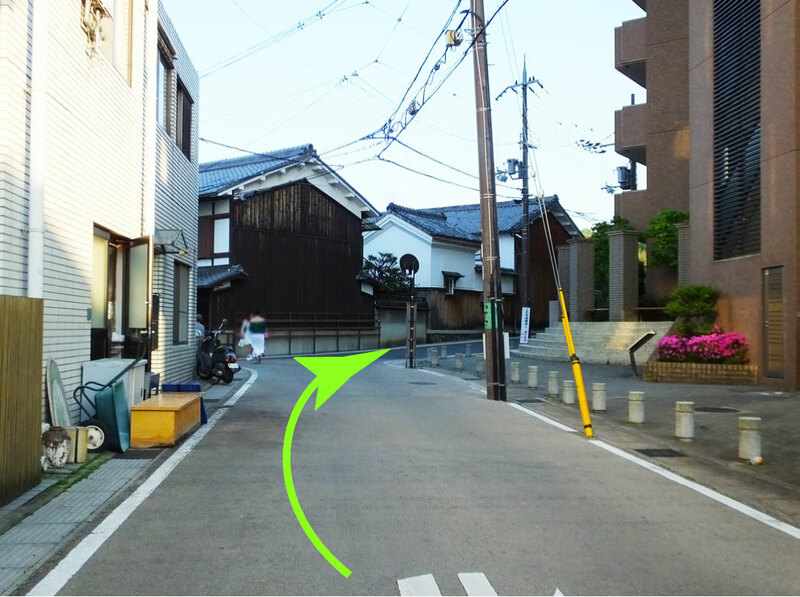 After a short walk, you will see Cafe Waraku on the right. Now you can go there on your own. Then, let’s see inside the cafe. Antique furniture, shikki lacquerware and things like that are arranged beautifully. The atmosphere is calm and relaxing. There is tatami mat space and a Japanese-style garden, too. The owner of Cafe Waraku said, “I want more people to know about how wonderful shikki lacquerware is.” Also she said, “I hope that Japanese craft will be kept alive for a long time.” Cafe Waraku is a great place where you can feel the tradition of Japan. I went there with my husband in June 2018. We had a set meal, Waraku Gozen (2,000 yen) and assorted sweets in shikki lacquerware, Suitsu-ju (1,500 yen). (The both include drink.) If you order Waraku Gozen, you can choose the main dish from meat and fish. I chose the fish dish. The menu changes every month. 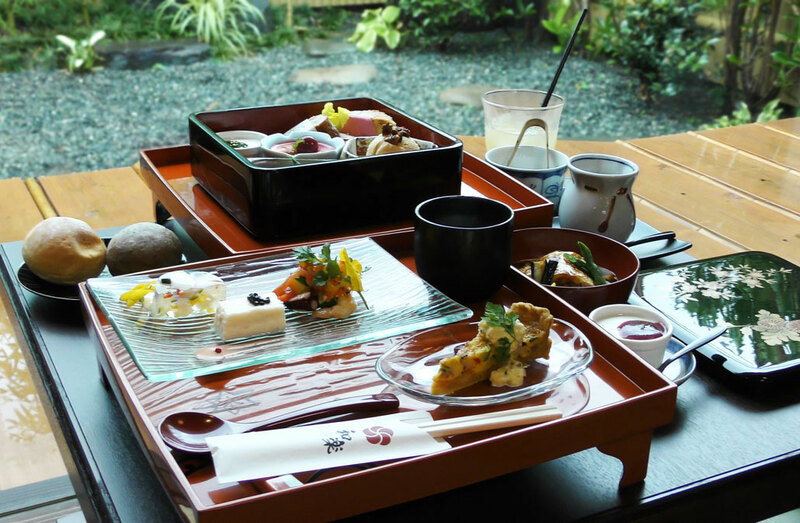 Waraku Gozen was served in and on quaint tableware. Garnished with flowers, it looked brilliant, and it caught my eye. An amuse-bouche was lovely, and the jellied vegetables looked as if twinkling. When I took the lid off the bowl, colorful vegetables and mouth-watering pie appeared and I was attracted to it. The amuse-bouche was delicious. The various flavors were a pleasure for the eyes and mouth. Whitefish was covered with the pie, and it was good with the flavorful brown mustard sauce. The sauce was thick and light at the same time, and I thought it was especially good in the season of early summer. Every dish was really good and I enjoyed it a lot. Here is Suitsu-ju. 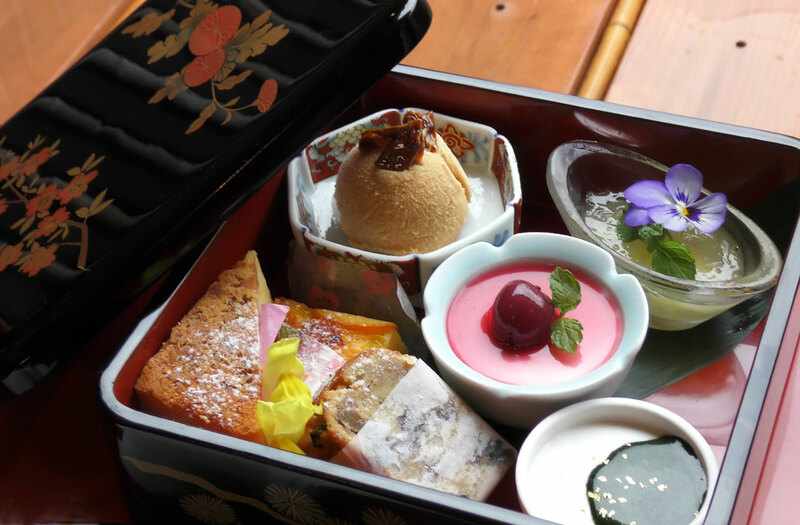 It looks elegant and luxurious, as well as Waraku Gozen. It includes ice cream, jelly, blancmange and cakes. It was fun to wonder what to eat at first. All the sweets were good, and the shikki lacquerware was beautiful. I enjoyed various flavors and I had a very good time. I recommend Cafe Waraku as it is popular among the local people, and moreover, the Japanese tradition is alive there. If you are going to travel to Japan, why not go there?